A sweep is a running play in American football where the running back takes a pitch or handoff from the quarterback and starts running parallel to the line of scrimmage, allowing for the offensive linemen and fullback to get in front of him to block defenders before he turns upfield. The play is run further outside than an off tackle play. A running play where the quarterback takes the snap from center, typically in a shotgun formation, and then runs to the outside. This play can best be run by a fast, athletic quarterback. Sweeps often involve pulling of offensive linemen, usually one or both guards, to provide extra blockers at the point of attack. Teams such as Arkansas have had success running this play by lining up the halfback as the quarterback in a wildcat formation. A play usually run from a wing-t formation that includes a variety of play fakes. The quarterback takes the snap and fakes trap to the fullback. He then hands off to a halfback or wingback, who runs to the outside. The buck sweep is normally blocked by pulling the playside guard to kickout the force defender, and the backside guard pulling and turning up on the playsided linebacker. This allows for the other linemen to downblock on the other defenders, giving the offense an advantage when it comes to blocking angles. The buck sweep also provides an advantage in the possibilities available from its action, with the fullback trap before the sweep, the waggle pass or bootleg after it, and the sweep itself. 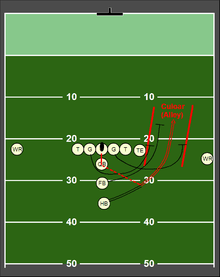 A toss sweep is a play that is usually run out of the I or Singleback formations. The quarterback takes the snap, reverses out, then tosses the ball to the tailback. When run from the I it allows the fullback to pick up any defenders who have penetrated into the backfield. Blocking from the offensive line ranges from straight zone blocking to pulling the playside guard. While this sweep doesn't have as many playfake combinations as the bucksweep, it tends to be more powerful and allows the running back to turn upfield faster. A running play that is run from a set with a flanker receiver split out to the side away from the play, often run with the flanker in motion. The quarterback receives the snap and runs out to the flanker side, the flanker in turn makes a deep arc into the backfield behind the quarterback, and then there is an exchange either by handoff or by pitching the ball to the flanker. Flanker Sweep typically resembles the Student Body Right in that every available blocker blocks to the playside. Vince Lombardi was fond of the sweep. ↑ Dean, Thomas A. (1 January 2012). "On Coaching Football: A Resource and Guide for Coaches". Universal-Publishers – via Google Books. ↑ "Toss Sweep Improves I-Formation Outside Run Attack". ↑ Roberts, Jerry (31 December 2015). "Pass Receiving in Early Pro Football: A History to the 1960s". McFarland – via Google Books. ↑ "Green Bay sweep - football play".